Ten Million Pounds of Trash Cleaned Of 17,719 Miles of Coastline – Neptune 911! Every year 6.4 million tons of trash reach the world’s seas. 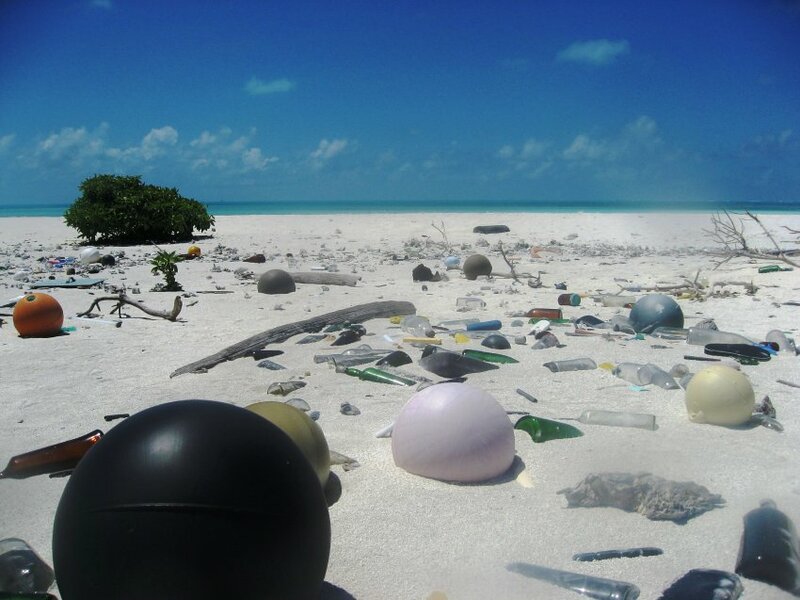 Pictured here is trash-strewn Papahanaumokuakea Marine National Monument in Hawaii. volunteers with the Ocean Conservancy picked up refuse that weighed as much as 10 Boeing 747 jumbo jets. Cigarettes, food packaging and plastic bottles topped the list from the 2012 cleanup. Debris from the Japanese tsunami and Hurricane Sandy also marred some U.S. beaches, the Ocean Conservancy, a non-profit group that works on ocean protection, reported Monday. Volunteers turned up some weird stuff, too: mattresses, candles, toothbrushes and sports balls. More than 550,000 people picked up in excess of 10 million pounds of trash along 17,719 miles of international coastlines in September during the Ocean Conservancy’s annual cleanup. Billed as the largest ocean-related volunteer effort in the world, the event spotlights just what sort of ocean trash washes up on beaches around the world and what can be done to scale back the refuse. Every piece of trash affects the health of the ocean and as a result the economy, the environment and animal health, said Nicholas Mallos, Ocean Conservancy’s marine debris specialist and a conservation biologist. Plastic debris has two risks, he said. There’s an entrapment or strangulation risk to wildlife. But the longer plastics are in the ocean, the more likely they are to absorb other toxins, too. There’s also a real cleanup cost to coastal communities. In tourism-dependent beachfront destinations such as Myrtle Beach, S.C., having a pristine appearance is crucial to attracting visitors. In the summer months, the city mushrooms from 27,000 year-round residents to the biggest city in South Carolina. Upward of 14 million tourists visit each year, and they’re accompanied by tons of trash, said Mark Kruea, a spokesman for the city. Myrtle Beach spends about $1.1 million annually on trash pickup, which includes raking the beach for trash every morning. There’s also been a greater demand for recycling facilities in recent years, Kruea said. The city has had visitors from out of state say they’ve taken their crushed cans and cardboard home with them, because recycling isn’t readily accessible at some vacation rentals. Recently, the city has been testing the use of recycling bins along a seven-block stretch of the beach. Beaches in places like Alaska, with more than 44,000 miles of coastline, and much of it remote, face a separate challenge. Currents and winter storms bring significant debris to the state each year, according to the National Oceanic and Atmospheric Administration. There, the problem is more likely to be abandoned fishing equipment. It’s not enough just to pick up the trash, Mallos said. The Ocean Conservancy would like people to focus next on producing less waste before it even makes its way into the oceans. That means taking simple steps such as avoiding single-use products and embracing reusable water bottles, coffee mugs and grocery bags.